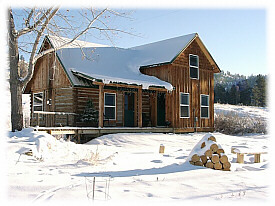 The Homestead is located on Eagle Cliff Ranch, 8 miles from downtown Billings, Mt. Eagle Cliff is a 1000 acre private ranch with a variety of wildlife and very convenient to Interstate 90. 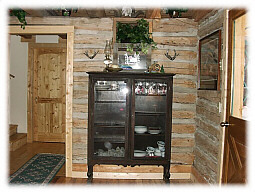 The Homestead is a rebuilt 1800's log cabin adding an addition with 2 bedrooms and 1 bath. Unique winding stairs lead up to the balcony which overlooks the log living room. The 2 bedrooms are upstairs with the bath on the main floor. The big country kitchen contains a 1920's wood stove for decoration. This quaint log cabin is decorated with memories from our past. 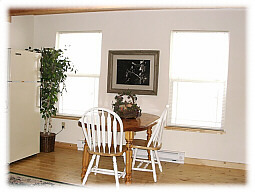 Every window has a ranch view where you can observe a variety of wildlife walk by. This is a NON-smoking home. 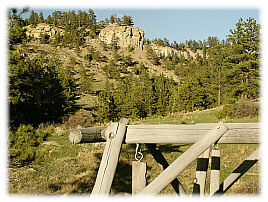 Eagle Cliff Ranch, a 1000 acre private ranch just 8 miles from downtown Billings. Bathroom is on the main floor. Big country kitchen, all modern facilities but decorated with "homestead" 1920's wood cook stove. 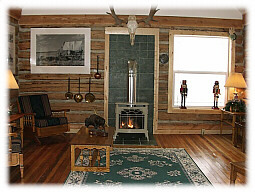 The living room is an 1800's log cabin, relocated and rebuilt on Eagle Cliff Ranch. An addition of 2 bedrooms and 1 bath was added to this log cabin. The parking area pulls up to a bridge that connects to the front porch. The ranch has 1000 acres of walking, mountain biking and cross-country trails. You can bring your own horse and board it at Eagle Cliff Stables. Pets possibly allowed. Pets have to be compatible with ranch pets and animals. A larger cleaning fee is charged with pets. Eagle Cliff Ranch offers hiking, mountain biking, cross-country skiing around it's 1000 acres. $50 cleaning fee without pets $100 with pets. 50% deposit with reservation, full refund if canceled 6 weeks before stay.